My work is in Venus Magazine! 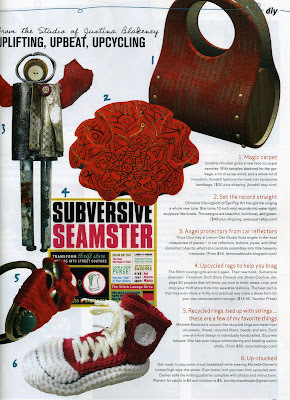 I received the new issue of Venus Zine in the mail and found my Ruby Red Mandala Record Bowl in the feature on upcycling! I am so excited. An Etsy seller whom I truly admire, theblackapple, was also featured in this issue for having topped the Venus Hott List for Best Indie Business! I have to echo what she said: "I couldn't hope to appear in an issue with a cooler cover girl. " "Upcycle is a term coined by William McDonough and Michael Braungart in their 2002 book Cradle to Cradle: Remaking the Way We Make Things. The writers use "upcycle" as a term to describe the process of converting waste materials into something of similar or greater value than the original substance. I first heard this term when I participated in Etsy's upcycling contest in early 2007. This is one of my favorite traditions. Happy Thanksgiving! Rock show coming up this Friday night! I am in a band called Dartgun. We just played a rad show last night at the Ash Street Saloon in downtown Portland. 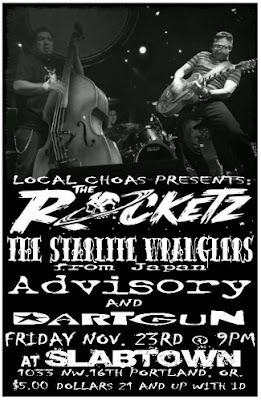 We are really stoked to get to play on Black Friday at Slabtown with some big names in the rockabilly world - the Rocketz from LA and the Starlite Wranglers from Japan! Here's my schedule of holiday sales I'll be participating in this season. They are all happening in Portland, OR, USA. If you are in the area, come say hello. There are SO MANY amazing artists and crafters in Portland and I am looking forward to spending some good times in their company, selling lots of great handmade stuff. Other cool vendors: Flipside Hats, Scrumptious Suds, Tinymeat, TQB Designs, and I will be sharing a booth with Sew Many Cats! located at collage, 1639 NE Alberta St. I have a solo show hanging right now at Elemental Arts, located near Antique Row in Portland's Sellwood district. 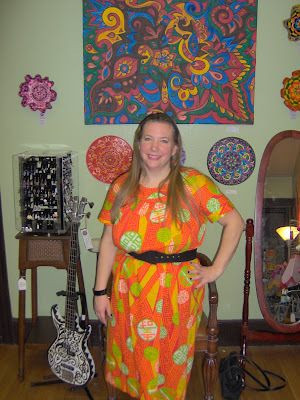 The title of the show is "Psychedelic in Portland" (after the title of my HGTV segment), so of course I had to wear my most psychedelic dress. 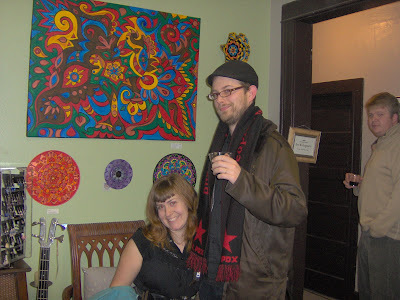 There was an opening reception on First Friday. It was even mentioned in the Oregonian! 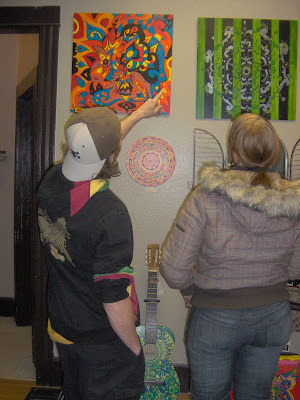 I pulled out all the stops and brought everything, including painted guitars, typewriter cases, and canvases along with my painted record items. 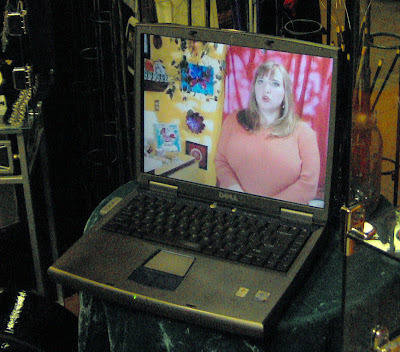 We even set up a laptop and had some "screenings" of my HGTV segment on "Look What I Did!". I sold a few things and had a great time. 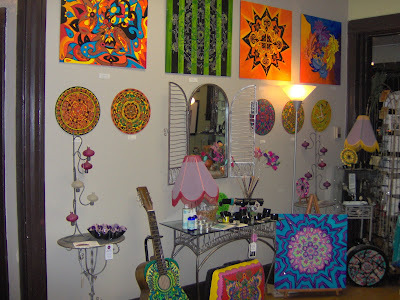 If you are in the Portland area, stop in to Elemental Arts at 6035 SE Milwaukie Avenue, right across the street from the Iron Horse Restaurant. 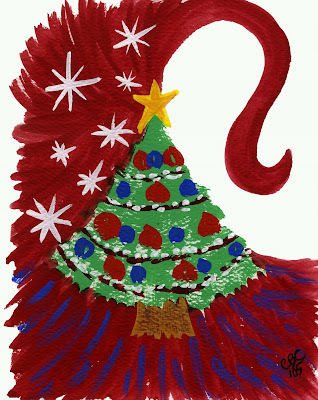 My show will be up through December 6, but I will continue to have selected works on consignment so stop in any time. 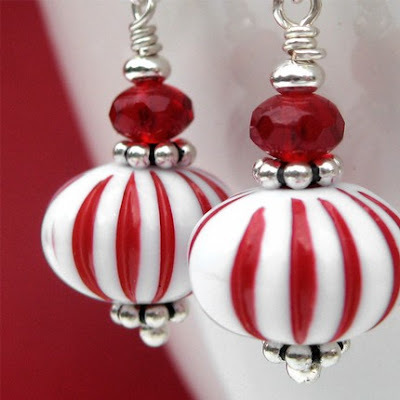 They also have wonderful handmade jewelry, handblown glass, and other unique gifts. 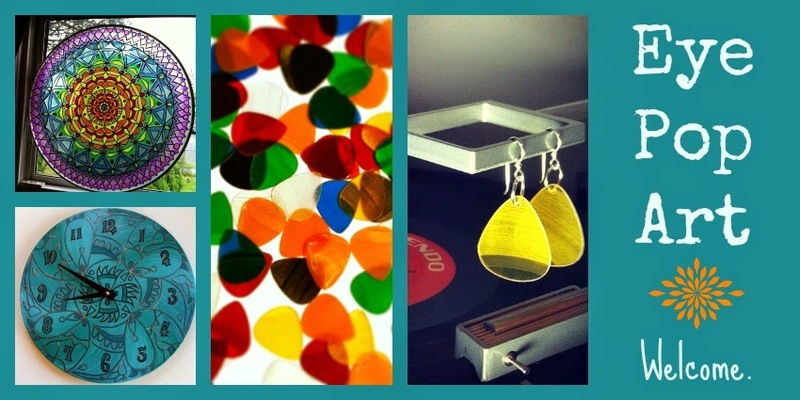 Take a look at this new treasury! My Ruby Red Record Bowl is featured along with items from Spiderbite and Her Royal Majesty Bags, both sellers that I admire. Plenty of eye candy for your holiday shopping! This picture of April Alden from Rosewebs appeared in the East PDX News this week. It went with an article about Trillium Artisans, the nonprofit organization where I work, called "Crafty Artisans Recycled Castoffs into Chic Art" by David Ashton. The caption to this picture: Trillium Artisan April Alden shows one of her Rosewebs wallets made from recycled and reclaimed lawn furniture webbing. She's also modeling a Liv & Lotus scarf, Stubborn necklace, and bracelet from Eye Pop Art. 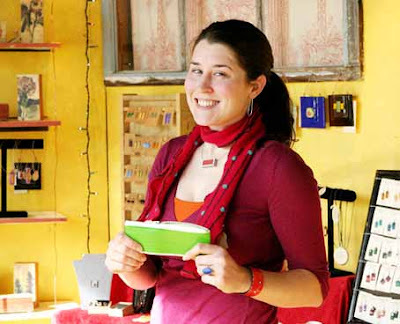 Read the full article to learn more about Trillium Artisans and see a picture of me too! Apparently Trillium is hot news right now - another reporter was going to write an article about us for the Gresham Outlook but she got scooped when Mr. Ashton turned his in to them first! Competitive journalists in East County, who knew. But the good part is that the other reporter, Merry MacKinnon, still needed a story to do, so she came over to my house this morning to watch my HGTV segment on DVD and interview me about being an artist (she also asked a lot of questions about my huge collection of psychedelic coffee cups!). She even called me back this evening to ask me more about the teaching work that I do, and when she heard about the mural project that I am starting tomorrow at Duniway, she immediately decided to do a story on that for the Sellwood Bee! So it looks like my face will be appearing in several neighborhood papers over the next couple of weeks. Pictures from the Halloween party! Every year we host a Halloween smash at our basement studios, and this year was no exception. Five bands played! Above is Octopus Recoil - their drummer is Chuck's 20 year old son, Andrew. 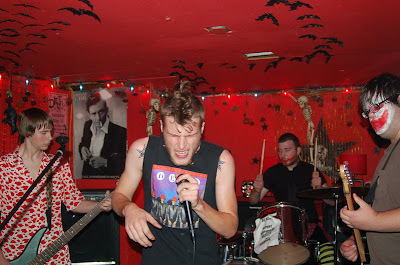 The basement party featured many Portland artists such as the adorable sensational rock of Cootie Platoon, the Portland Wall of Sound Dartgun, the angst throttle Octopus Recoil, and the zombie blood rock of the Decliners. Dartgun HQ is the interior of a magnified mansion that exists inside microdot. Shave away the walls of a sugar cube and the bright lit interior of psychedelic syrup runs out of every crack of the house. I.E. 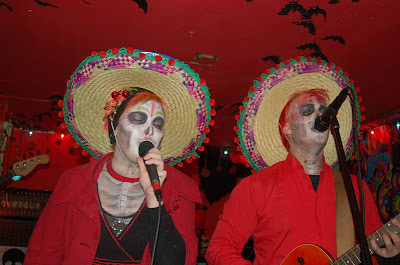 it was a great setting to have a Halloween party with a bunch of Portland musician friends. And the video turned out red and awesome. If you're in Portland, come check us out! 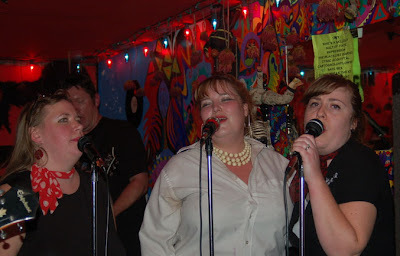 We played a great "doo wop hop" at Ash Street on October 30 and are totally stoked to play there again. 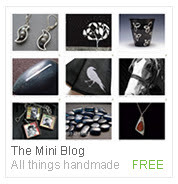 There's a new project that was just launched today - it's a blog called All Things Handmade and it is a listing of "minis" from any Etsy shop that wants to submit. Everything you need to know is on this site so please click over and learn more! If you are an Etsy seller, it is super easy to have your mini added - just leave a comment on your category page with the proper information and it will be up shortly for customers to view. I am a volunteer "curator" for the site and I am in charge of the category "glasswares for the home." 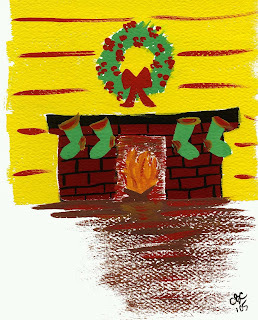 This blog was created by Littleput Books and schOOLLOcker. I'm really excited to be a part of this cool project. If you are frustrated with the search capabilities of the Etsy site, you now have a whole new way to shop by category. So how was the trunk show? 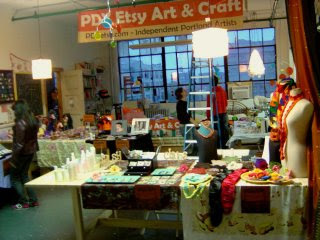 After all the hype leading up to the PDX Etsy team's trunk show at the Etsy Labs in New York on October 26, you may be wondering how it all went down. I did not attend in person (I just sent my stuff), but several Portland Etsy sellers did, and I guess it wasn't all that great, unfortunately. I sold one $12 item (well, Kristin sold it for me - thanks, dear!). In a way, I am kind of glad, because now I have plenty of items to take to my upcoming holiday shows, and to list in my shop. You can read more about the event on the PDX Etsy blog. So...all the lovely new matching cuff & mirror sets I made for this event have come back to me and I am hoping to get them listed for sale soon! By the way, thanks to all of you who gave me feedback on my new product idea - I put everyone's names in a jar and ended up drawing the name of dbeadery as my prize winner. She was very happy to receive a free Mod Mandalas Coloring Book, which she is looking forward to sharing with her grandchildren.